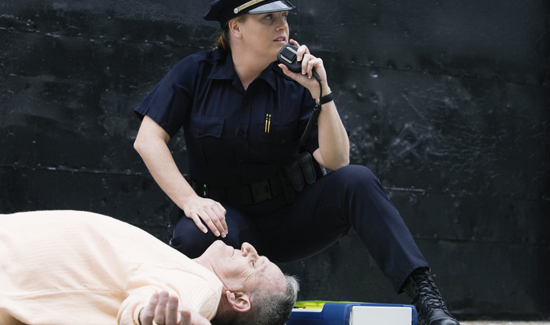 If there’s one thing that really comes in handy when you’re having a heart attack, it’s a well-trained police officer trained in CPR and how to use a defibrillator. Gary Langston is the president of the Indiana Trucking Association. He was in D.C. this time last year when he began to feel ill. He sat down on a bench to rest, and the next thing he knew “people were pulling on me and yelling my name,” he recalled. Langston recently went back to D.C. to thank the cop who saved his life. Capitol Police Officer Nicholas Simons was working when Langston had his medical emergency. He performed CPR and used an automated external defibrillator on Langston. Langston survived. Turns out Simons had recently completed additional CPR training, a supplement to the standard training all officers receive. He said he was inspired to do the training by a friend who had recently used CPR to save an infant.